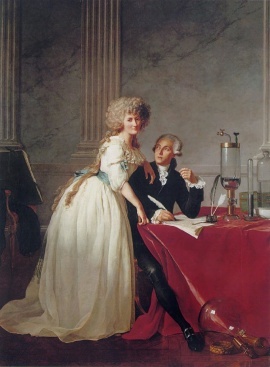 Portrait of Monsieur de Lavoisier and his Wife, chemist Marie-Anne Pierrette Paulze, by Jacques-Louis David (1788) Marie assisted Lavoisier in the laboratory; she also studied art under David the better to illustrate the resulting publications. Tobacco-watering was the least of Lavoisier’s pastimes. Unfortunately, Lavoisier funded these eggheaded avocations with an investment in the Ferme générale, the hated tax-farming syndicate to which the crown outsourced its revenue-squeezing operations. This is just the sort of operation one would expect to find in the crosshairs of the French Revolution’s Terror: hence, watering the people’s tobacco. The company was shut down in 1790. But at the height of the Terror, Lavoisier and 27 fellow tax-farmers of the Ferme were rounded up and quickly condemned. It took only an instant to cut off that head, and a hundred years may not produce another like it. [i]n spite of his great services it is impossible to overlook the sins of Lavoisier in appropriating to himself discoveries made by chemists who were his contemporaries or predecessors. Oxygen was first discovered by Hales in 1727, and had already been prepared from mercuric oxide by Priestley in 1774, by Bayen in the same year, and still earlier by Scheele in 1771. It was at a dinner at Lavoisier’s house that Priestley confidentially communicated his discovery to Lavoisier, in 1774; in 1778 Lavoisier then claimed for himself the discovery of the composition of water, whilst, as is now known, Blagden, a friend of Cavendish, when visiting Paris in 1781, told Lavoisier that Cavendish had discovered the composition of water in a very simple manner by burning inflammable air (hydrogen), as water alone was formed during this combustion. Lavoisier and Laplace immediately repeated the experiment and then communicated the discovery to the French Academy in 1783. These facts certainly do not obscure the fame of the great scientist when we remember his eminent services, but in the interests of historic accuracy and justice it is impossible to pass them over in silence. The word scientist didn’t exist in 1794, it was first minted by William Whewell in 1834. The story about the revolution not needing scientists/chemists/geniuses exists in various forms but I’ve never seen a source for it and I suspect it’s apocryphal.